My first impression of Lorelai’s Tiara was Gilmore Girls? It was quickly followed by Aww… what a pretty colour! 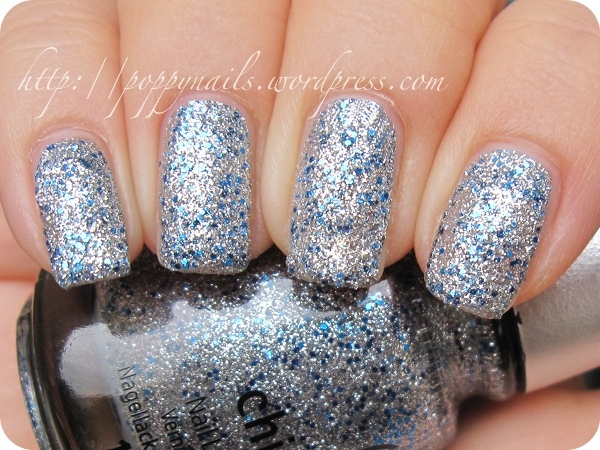 This is a clear base filled with gazillions of small silver glitter and slightly larger blue ones. The polish is from the 2011 Eye Candy collection and is part of a pack of six. It’s very pretty and glacial and was so opaque it can be worn on its own. I love dense glitters like that. They are perfect for shiny French tips. 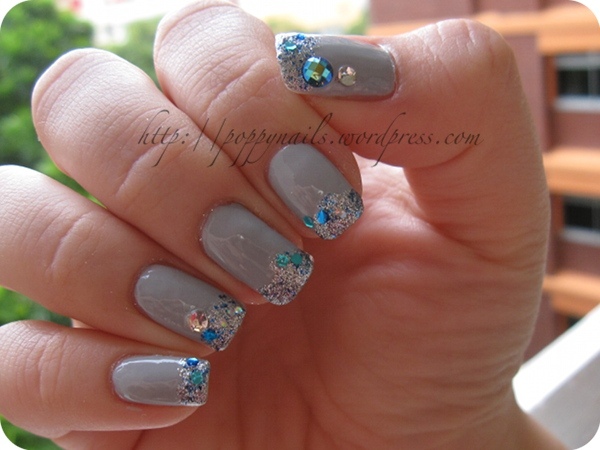 Here are Alicia nails with a blue-grey Maybelline base and Lorelai’s Tiara as the glitter tips. I stuck on some other larger blue pieces from another polish and added several crystals on the ring finger and the thumb. We were trying to achieve a mermaid effect with the aqua and the moody grey. On hindsight, there could have been a greater contrast between the tips and the base polish. A darker base, for example, may have being better at bringing out the glittery effect. I am so happy to be featuring someone else’s nails apart from my ugly ones on this page!